One of Australia’s most important economic gateways will soon house a state-of-the-art shipping management control system to be installed at Port Hedland, the world’s largest bulk export port. The system includes a command and control system integrated with advanced radar, long-range closed circuit TV and voice radio technology to safely manage and guide thousands of ship movements in and out of the tidally constrained port with pinpoint precision. The Vessel Traffic Service (VTS) will be designed and installed by Australian port management and navigation technology integration company Australian Maritime Systems Group (AMSG). The VTS is part of a $70.7 million investment by Pilbara Ports Authority in a new Integrated Marine Operations Center. AMSG Managing Director John Sugarman said the system would help drive improvements in safety, productivity and efficiency. “The incredible volumes being exported through Port Hedland, combined with its unusual geography and tidal conditions, presents a massive challenge to Pilbara Ports Authority and one which AMSG is proud to deliver a technical solution for,” Sugarman said. “Vessels up to 340m in length have to be guided through a narrow channel to reach Port Hedland – a vessel leaves the port every 30 minutes during a tidal sailing window of four to five hours. A record 460.4 million metric tons of total throughput was exported through the Port of Port Hedland in the last financial year – or around $100 million worth of commodities every day. Pilbara Ports Authority’s General Manager Operations Captain John Finch said the new VTS is an example of the organization’s commitment to industry leading practices and technologies that optimise performance and enhance safety across its ports. 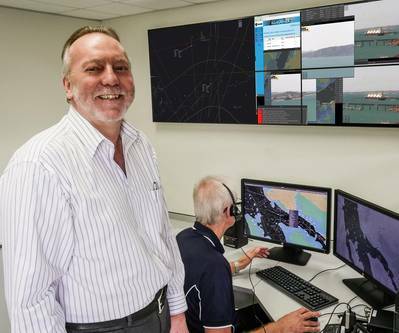 “Pilbara Ports Authority has a strong focus on continuous improvement and looks forward to commissioning the world-class VTS system to help manage thousands of vessel movements at the port each year,” said Captain Finch. The new system will be commissioned following construction of the Integrated Marine Operations Centre in late 2018. The core of the system has been developed using the premier Saab V3000 Command and Control VTS Software, which has been implemented at many of the world’s largest and busiest ports, including international giants such as Shanghai, Hong Kong and Rotterdam, and Darwin and Fremantle in Australia. The VTS will also integrate systems and products from global providers such as Kelvin Hughes (radar), Silent Sentinel (CCTV) and Zetron Australia (Voice Switch). The new contract further strengthens the partnership between AMSG and the port authority, after AMSG designed and commissioned the VTS at the Port of Dampier – the world’s second-largest bulk export port.